Scid vs PC is a usability and bug-fix fork of Scid (written by Shane Hudson and Pascal Georges). With it you can play chess online or against the computer, browse tournaments downloaded in pgn format, and create huge chess databases. * Show checkmate/stalemate messages instead of sending 'no-move positions' to engine. * In engine configuration window the 'Date' field of an engine is now its exe modification time (mtime). * Speed enhancements for processing UCI engine moves (pv). Gregor's improvements to the player and tournament finders (which Shane never implemented properly). * Previously - only the *first* 50 tournaments were used (eg) when looking for the 50 tournaments with most players. * Compilers must now support c++0x / c++11. Custom player photos (Place correctly named gifs in $HOME/.scidvspc/photos or bin/photos). Resign button for playing UCI engines and Phalanx, analog clocks can now be hidden ('x' button in the white clock), and add the 'Skill Level' to the pgn header (eg - as used by Stockfish). A patch to include Gregor's tk::text improvements. New Chess 960 patch! Thanks to Britton Farrar, who now has a project at https://github.com/brittonf/scid-vs-variants. New 'Under Promotion' search item in General Search. Computer Tournament: when 'First engine plays others', flip board to show games from first engine's view. Flip game browser if matches myPlayerNames. Clipbase game limit is now 5,000,000, and game undo buffer is 20. Chess Pieces: remove 12 piece-set limit, and adventurer and kingdom pieces. Reinstate old Merida1 as Merida3. Row colour is now configurable for Player/Tourney/DB finders and Crosstable rows. * Offers graph is updated in a better manner. * Save game and add message disconnected while playing. * Top three buttons are now configurable. * Add a 'follow+' command, which automatically saves followed games. Tweak Find Best Move feature, which now also recognizes non-standard starts. Game Save dialog: extend use of 'Use prev tags' to 'Use previous' (for Names, Site, Event, Elo, dates). Switcher - replace readonly foreground color with a '(readonly)' message, and add a 'Confirm Copy' option menu. Disable tree updates while annotating games and computer tournament. Tree: Instead of having a 'stop' button, grey the tree text when updating (if progressBar is hidden). Change a few shortcuts. control-b board colours. control-B setup board. control-G general search. Control-TrialMode button, automatically adds a null move, and tweak the trial mode button pic. PGN Import now converts any empty Name/Event/Site/Round tags to '?' (according to pgn standard, these should not be empty). Minor fixes for Setup Board. Allow Merging Games with non standard starts. Bind pressing 'vv' keys to enter first variation. Remove Crafty specific command 'mn', and it seems unsupported in Crafty 25. In the tree window, when deselecting "Adjust Games", we now keep the current gamelist/filter. Right clicking 'Exit Var' button will exit all vars. Fix a nasty memory leak (in PgnParser). Fix name counts when using globbing in the name editor. Some charsetconverter (internationalisation) fixes from Gregor. Removed xdg-open for opening URLs which just doesnt work for me. Tree info button (short display) was broke. Bugfixes for compiling on some linux platforms (including Raspberry Pi 2). Some clock fixes. Digital clock was busted (counting up). CompTournament clocks are now digital only. Stop tacgame/phalanx from failing to restart. New Best Games widget, similar to the Gamelist. Score Graph now highlights the current move. New annotation feature: Show missed/shorter mates. A little new Gamelist button to reveal hidden/squeezed buttons (finally!). The GameInfo Window has a right-click menu, and other minor menu changes. Basic support for horizontal scrolling (in gamelist, crosstable and bestgames) for mousewheel buttons with horizontal capability. Finnish translation, from Mika Kaakinen. Engines: if an engine shows a Mating line, show the whole line in analysis window, disregarding Max-Ply variable. Don't show an error message when importing null PGN tags... too verbose. Fics: try to handle case when move is made after run out of time. (We don't want to mark the game as out of sync). Minor Translation, Mask and Fics tweaks. Hide Board resize buttons in docked mode if auto-resize is enabled. Revert Control-b binding to Book window. Focus the text box of Comment Editor when raised. Show a busy cursor when backing-up databases in the finder. Game Save: also use previous Round with the 'Use Previous' button/feature. Running Engine 1 in the statusbar needs special handling if using docking, as it cannot be withdrawn properly and was confusing before. Show correct position in the pgn window after adding a new var/move. Show PGN scrollbar by default. Redock Windows after they have been undocked then destroyed. Before, such windows were remade undocked, and *without* menus. Keep comments when truncating game from start. Fix broken 'Copy' button in Engine's config window. Promoting variations didn't handle precomments. is there a portable version? There is a compatible version for Android. New 'Default Databases' feature (Options->Save Bases as Default). CQL 5.2 search feature (Search->CQL). Thanks Lionel and CQL authors. General search can now match any (non-hidden) pre-game or final move Comment. Big speed up for bulk Strip Comments/Variations feature. (Also make the 'Stop' button work). Improvements to loading games at the correct position (resolve a conflict between the tree window and search results), and small Tree speed-up. Remove 'Magnetic' for Paul's chess pieces. New 'Ascii' chess pieces (thanks HGM) and 'Green' colour scheme. New Turkish translation (thanks Ali Sen). Right-clicking button bar changes, including right-click Window button shows Splash window. Some tree tweaks and doco updates, and tree Fast+Slow mode now doesn't break the win/lose graph. Tweak progress bar update frequencies (base export, game copy). OS X has a faster build. New Windows build system from Oz. A new script, 'sc_filter_pgn', which filters multiple PGN files for games matching a certain position. FICS - Offers Graph is disabled while playing a game. Change the censor button a little, and control+censor censors person chatting to you. Escape key in main board cancels piece dragging/move. Input engine fixes (DGT board). Widget now resizes ok, and bitmaps display properly on OS X. Thanks to Davy De Roeck for debugging it on OS X.
Fixes regarding other language piece letters. Fix up showing the first gamelist/game in searches. Fix up the days of the months in the calender widget. Fix up window placement on multi display desktops. Best games 'Reset Column titles' was broke. sc_game startPos segfaults if !HasNonStandardStart. The Score Graph can now display move-times (using "%emt" and "%clk" pgn values). Option to display a black rectangle for the "selected square" instead of a coloured square (Options->Moves->ColorSelected). Several translation updates including a complete German help file from Christian Opitz. The Setup Board window now has a coordinate axis and a flip button. Computer Tournament - Don't enforce a ten-engine limit, have a new statusbar to show progress and the winner, include Uwe Klimmek's carousel scheduling. EPD rewrite from Bonnie A. - Annotations are now compliant with the EPD specification, Flips the board to side-to-move, other bug fixes. In Game Annotation, don't miss analysing last-move blunders. The ECO finder has a basic "Find Opening by Name" feature. A quick Piece Position Search implemented using CQL. Gameinfo window always shows a rehoned "Material Advantage" value. Board Options window can now display all custom piecesets in a gridded manner, and also highlights the current piece style. FICs - Automatically store move-times, some changes to the button/font, and don't store adminBOT tells. Tree Mask - Add 'unfold' option to the Mask window, and fix up some allignment/font issues. Update the Spelling file with Uwe's 2018 update. Pressing 'End' key moves to end-of-variation (if in var) instead of end-of-game. Minor Book Window fixes - enable undo, remove the arrow buttons (use wheelmouse instead), and properly name and document the 'Other Moves' button. Analysis Engines: pressing keys 1 to 5 sets PV. Set undo point when marking squares. Update Gregors tktext patch to current (2018-08-13). Xboard protocol fixes: setboard should come after analyze, send 'nopost' to xboard engines in comp mode, and acknowledge 'my move' in analysis, as sometimes xboard engines (scidlet) dont send any other infos. Relocate a couple of colour option menus to their proper windows (Crosstable and Score Graph). In PGN import, handle the case when there are two comments for a single move. Fix serious built-in-engine and PGN-import errors. Tree - the greying of the tree moves (if the progressbar is hidden) disabled the tree mask's move colouring. Disable gamelist flag/delete menus if read-only. Mate in N fix and hardening. Ignore Country names if they dont look right in the gamelist and database sort. Disable MS Windows screenshot feature (broken in Tk). difference between this and Arenas? Arena was built as a chess platform to play engine vs engine games, with many features added around. 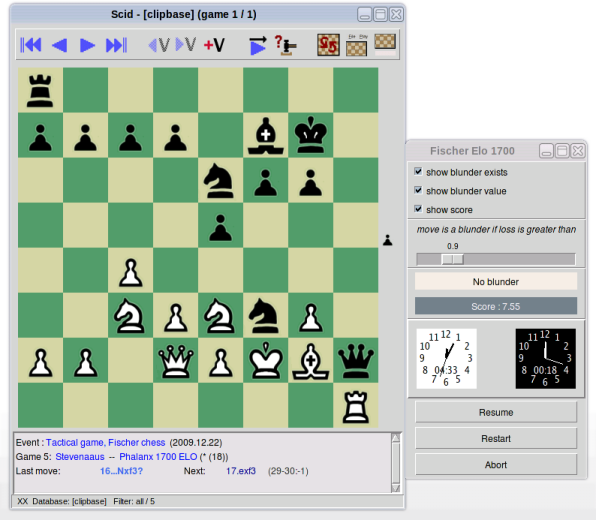 Scid vs. PC was built as a chess games database, with other features added as well. 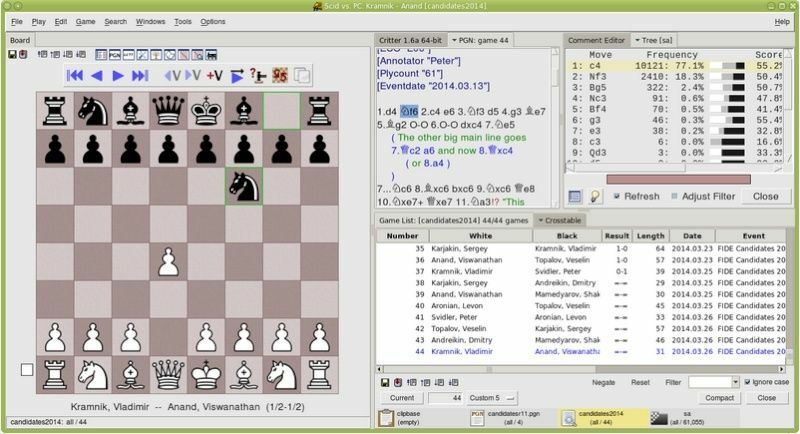 If you favour playing engine vs engine games probably you will be better with Arena, if you value chess databases you can have them very large and fast with Scid or Scid vs. PC.